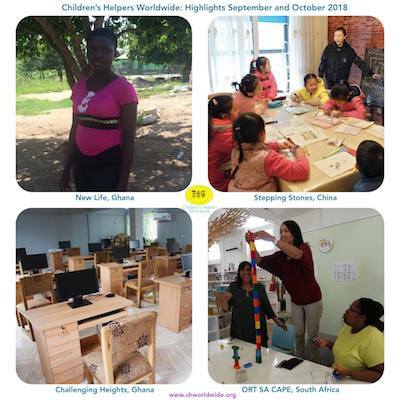 Children's Helpers Worldwide | A Busy Couple of Months and Lots of Projects! What is your Fante Name? A Busy Couple of Months and Lots of Projects! We want to share with you some highlights from September and October. We are grateful to CHW’s supporters for all that they do to help children! – School supplies were sponsored for Cecilia, a teenager at New Life’s children home in Ghana. She started Senior High School in September! – Teaching materials were sponsored for the semester for the children at Stepping Stones’ educational programmes in China. Stepping Stones works with migrant children in Shanghai and left behind children in rural parts of China. These are children who stay behind, whilst their parents leave to work in a city. – The installation of internet facilities and a new networking system were funded for the computer lab at Challenging Heights’ shelter in Ghana. The children at the shelter have been rescued after being trafficked into the fishing industry. They receive special care to help with their rehabilitation. Internet access at the computer lab will improve the education they receive whilst at the shelter. – On 10 October, ORT SA CAPE in South Africa held a LEGO Six Bricks training session for 13 teachers. The teachers learned about the many important skills that can be taught and developed using LEGO Six Bricks. More information about this training can be found in our report on GlobalGiving, here. – Last month, we were able to send a donation to FAST in Romania to help them towards the completion of the shower block they are building, as an extension to their centre in the village of Tarlungeni. It is planned that there will be a washing machine in the block too, which will be great for the families who lack washing facilities at home. FAST is looking forward to promoting health and hygiene in the village. Thank you very, very much to each person who has been involved with making these projects possible! Your support is making a difference for children all over the world! Help the children we work with. Teaching Materials for migrant children, at Stepping Stones’ programmes in China. The needs of the children at Casa Mea in Romania. Sponsorship makes a lasting difference in the life of a child.